Made to order from grey quartzite or black slate, size 100x100mm, thickness 25-45mm. 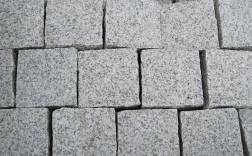 A hard durable medium grey speckled granite, size 100x100x40, hand chipped edges, exfoliated (flamed surface). 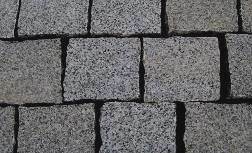 A hard durable dark grey speckled granite, size 100x100x40, hand chipped edges, exfoliated (flamed surface). Australian hard durable medium grey speckled granite, size made to order, all natural break surfaces. A hard very dark grey basalt, size 100x100x40, all surfaces natural break. A hard often banded whitish to yellow/orange sandstone, 100x100x(25-35)mm, hand chipped edges. Made from various materials, size to order (advance orders only). 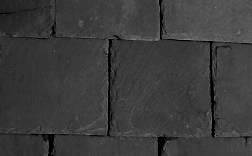 Black slate (colour fast), 500x250x7-8mm, hand chipped edges, with or without nail holes. Black with orange/brown rust patterning, 500x250x7-8mm, hand chipped edges, with or without nail holes). 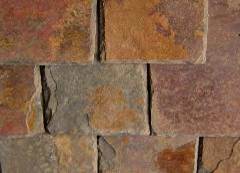 Without nail holes makes a very cost effective stone wall cladding.